Polite society has several rules, sanctions that clearly define proper behavior in a civilized world. The list of rules are many and the specifics of many of them can be pretty confusing. There are classes that can go on for days all about which fork goes where and how many minutes are required to pass from the time the soup is served until you’re allowed to touch the second one! Phew! It is a lot to keep track of! How can anyone be expected to adhere to every step along the way!? Well, we’re happy to do what we can to help at least take some of the urgency off your plate. Or, at least your door! Everyone knows that when the bell rings, you should get to the door in a reasonable amount of time to greet your guests. But, when you’re so focused on which fork is the right one, sometimes it can take a few extra seconds. For that, we offer the Animated Doorbell Eyeball! Forget a doorman! Now your guests can be greeted by one large glowing green eyeball. 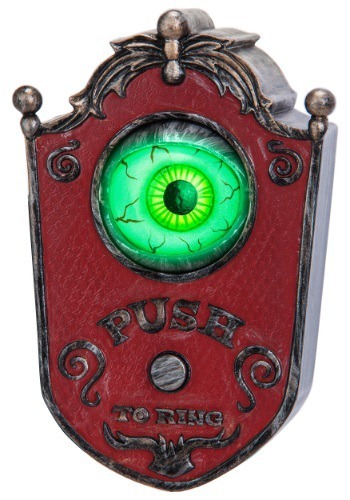 When your guests press the button, the eyeball moves, lights up, and speaks. It really is an 'eye-opening' home decoration that will ensure you have those few spare moments to greet them yourself!